One of the main attractions in Peru is undoubtedly Machu Picchu and the world-renowned Inca Trail that leads to this impressive site. However, this is far from the only interesting place to explore in the country, which is why it’s worth taking an extended trip and seeing a bit more of what it has to offer. To whet your appetite for travelling in Peru, we’ve put together a list of some of the top sights in Peru that you can visit in addition to Machu Picchu. 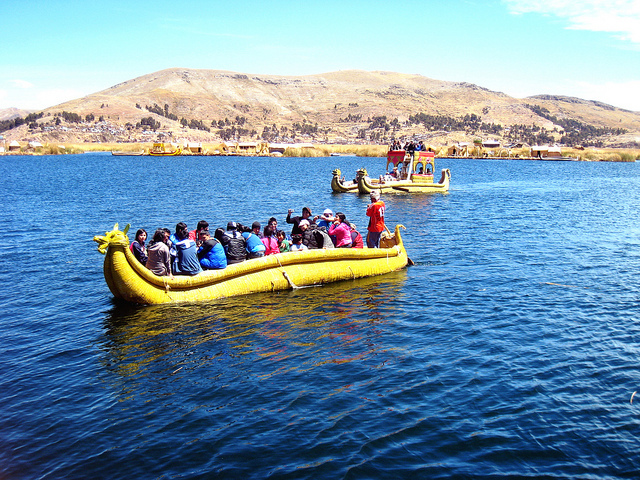 Lake Titicaca is an absolute must-visit if you’re touring Peru and is much more than just a lake. One of the things that makes it so spectacular is its location – high on an Andean plateau at 3,820 m above sea level. It has the distinction of being the world’s highest navigable lake and it’s home to some incredible communities. The Uros people who live on Lake Titicaca have inhabited the region since before the Incas rose to power and their way of life is truly fascinating. They live on floating islands made of reeds and still use traditional rafts to get around on the vast lake. The men here are renowned for their amazing embroidery and you’ll usually have a chance to see them at work if you visit Taquile Island. Taquile Island is also where you can learn more about the Uros’s culture, with the locals happy to showcase their unique music and dancing – a truly memorable experience. You’ll have time to explore the village and do some shopping for local handicrafts before you return to the mainland. Although it’s the Incas who are the best known ancient civilisation in Peru, they are far from only people to have inhabited the region. The Nazca people thrived in the area around the country’s southern coast between 100 BC and 800 AD and left behind an interesting legacy in the form of the Nazca Lines. This incredible artwork can only be seen from the air and is an amazing series of pictures etched into the desert floor – you can see a monkey, spider, hummingbird and whale, as well as geometrical shapes – all drawn out in the sand. Historians and archaeologists still have little idea what these markings were for and are particularly puzzled as to how they were created given that they can only truly be appreciated from the air. Arequipa is one of Peru’s largest cities and is also home to some important heritage monuments. However, these don’t relate to Peru’s Inca history but are part of the Spanish culture that developed following the period of the conquistadors. Among its most famous monuments are its cathedral, which dates from the early 17th century, and the Santa Catalina Convent, which is an impressive walled town that’s often described as a city within a city. At one time this was home to 450 nuns, who lived their lives in total isolation. There are some beautiful buildings in Arequipa, particularly around Plaza de Armas – the main square – so it’s worth setting aside a day or two to fully explore the city. If you’re keen to jet off to Peru to explore some of its amazing heritage – from the Inca Trail to Lake Titicaca – check out the itineraries that Explore Worldwide offers.